You are here \ South Africa Weddings \ Tie The Knot \ Wedding Tips & Advice \ One For The Guys – Surprising Her With a Ring When You Propose? And how do you know what size to buy? 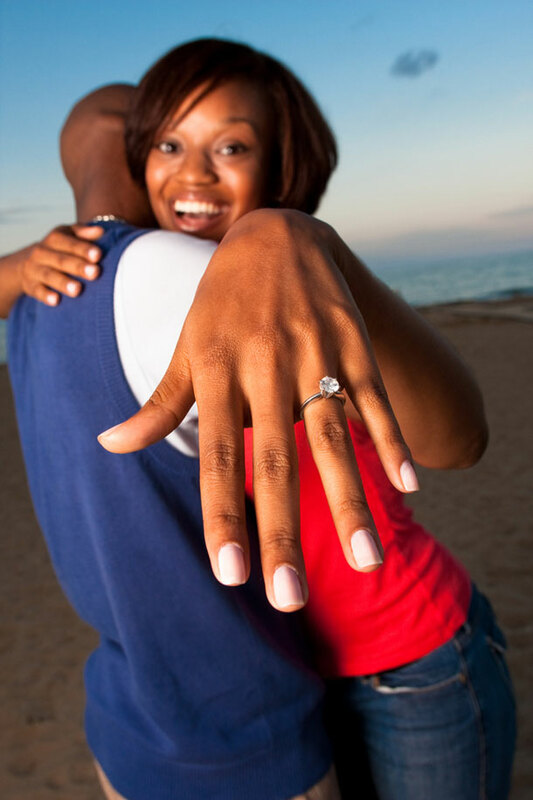 You’re about to pop the question and beginning to play with the idea of buying the ring. But before putting down a serious wad of cash you need to know something about choosing the perfect diamond ring. We’ll ease the squeeze just a little by pointing out that if you buy the ring from a reputable jewellery store, they’re sure to have a returns policy that will allow her to come in and exchange the ring for something she likes a little more. And with that major headache behind you, you’re a lot more free to give the shelves a good once over for something you’re sure she will like, without the added stress of knowing that if you screw up, it’s the wringer for you. Better still, put off the agony of choosing the ring and buy only the diamond, set it in a little box and let the magic of the stone clinch the deal for you. And ring size? You could try tying a string around her left ring finger whilst she’s asleep. Conversely find out the size of the rings she wears on her right hand and go with that. You can always adjust a ring size afterwards.